GREAT PRICE REDUCTION! GORGEOUS EQUESTRIAN PROPERTY w/TWO HOMES in the River Creek Golf Course area, near Yosemite & Bass Lake. Sq ft & baths listed is for both homes combined. The Main Home a successful short-term rental, and is 3748 sq ft, 4 br/4 ba; w/a den used as 5th bedroom. It includes many upgrades & high quality construction such as granite counters, loads of built-in storage, a variety of hardwood trims, solid wood doors & cabinetry, skylights, 2 dining rooms, expansive living room & family roomGREAT PRICE REDUCTION! GORGEOUS EQUESTRIAN PROPERTY w/TWO HOMES in the River Creek Golf Course area, near Yosemite & Bass Lake. Sq ft & baths listed is for both homes combined. The Main Home a successful short-term rental, and is 3748 sq ft, 4 br/4 ba; w/a den used as 5th bedroom. It includes many upgrades & high quality construction such as granite counters, loads of built-in storage, a variety of hardwood trims, solid wood doors & cabinetry, skylights, 2 dining rooms, expansive living room & family room. You'll love the covered porch areas & concrete patio, pebbletech pool & hot-tub w/large rock waterfall, & firepit, and finished 3 car over-sized garage w/loft. It's a perfect home from which to explore the nearby area - Yosemite National Park, Sierra National Forest, nearby lakes and ski areas, rodeos, fairs, festivals, antique shops, old mining towns, historic sites & museums, and many restaurants, breweries, bars, & shops in the surrounding towns near Oakhurst & Mariposa. The fully permitted Second Home is newer construction, an 1875 sq ft, 2 br/2ba, w/modern styling, great room, 2 types of granite, high ceilings, gorgeous hardwood trims & cabinets including hickory & streaky maple, and 2 baths w/ Jack & Jill shower. 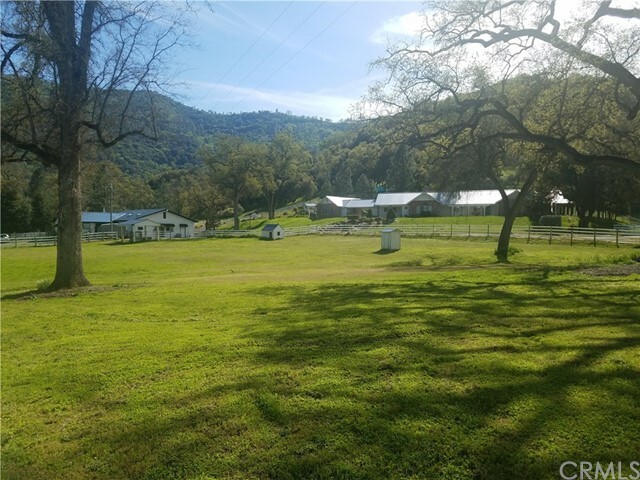 Multiple pastures, stables, round pen, sheds, paved roads & driveways, and extensive fencing make this mini-ranch perfect for large animals & people to relax and truly enjoy. Live in one, and rent out the other, or create your own family compound.